The Skirmish Series by Classic Army have always been an affordable and lightweight AEG series that features innovation at an affordable price. Starting with the externals of the gun, the handguards offered with these guns are modular freefloating polymer handguards that allow you to accessorize your rifle any which way that you want. The KM forends utilize Keymod mounting technology which allows you to add or remove rail sections where you need. The body is a unique style mimicking the billet style receivers found on the real counterpart which translates to a more rigid airsoft gun. To round that off you get flip up sights. Looking at the internals of the skirmish series AEGs, you get an 9mm reinforced gearbox with a quick-change spring guide. The gearbox has been reinforced further from the first generation of the Skirmish line to be even stronger. The quick-change spring guide will allow you to change your spring rates and velocity without opening up the gearbox. The biggest change to the skirmish series is now the ECS programmable fire control system. This allows you to program your gun to fire in different modes without doing anything except pulling the trigger. This will allow you to program semi only, burst fire, or a mix of different modes. The ECS trigger also is very tactile and has a short pull unlike most AEG triggers so you get a very positive feel when firing this gun. The motor is also an upgraded type and will give you a better trigger response overall compared to most guns. This gun is packed full of features and value and should definitely be looked at if you want performance. Our starter kit for this gun comes two ways. You can select the basic kit which will get you what you need to use the gun and if you are looking to go playing at a field, the complete kit will include all the necessary gear to do that. The first key items you need to run the gun will of course be a battery and charger. The batteries in this kit are high quality Nickel Metal Hydride (NiMH) with a 1600 miliamp hour rating. This will let you fire the gun for over a thousand shots before having to recharge. The charger in the kit will be a smart charger which will stop charging once it detects your battery is full. Some guns in the market include what is called a standard wall charger. These are simple and charge slow and do not turn off when your battery is full. The danger with that is you can risk over-charging the battery and causing a fire or destroying the battery. It is difficult to approximate when a partially charged battery will be fully charged. A smart charger will save you that trouble. The battery and charger in this kit will be selected by us and are all of high quality brands so you can be assured you are getting the best. The BBs included will be non-biodegradable .25 gram BBs in a 2700 count bottle. BBs is an important item and one that deserves its own topic of discussion. 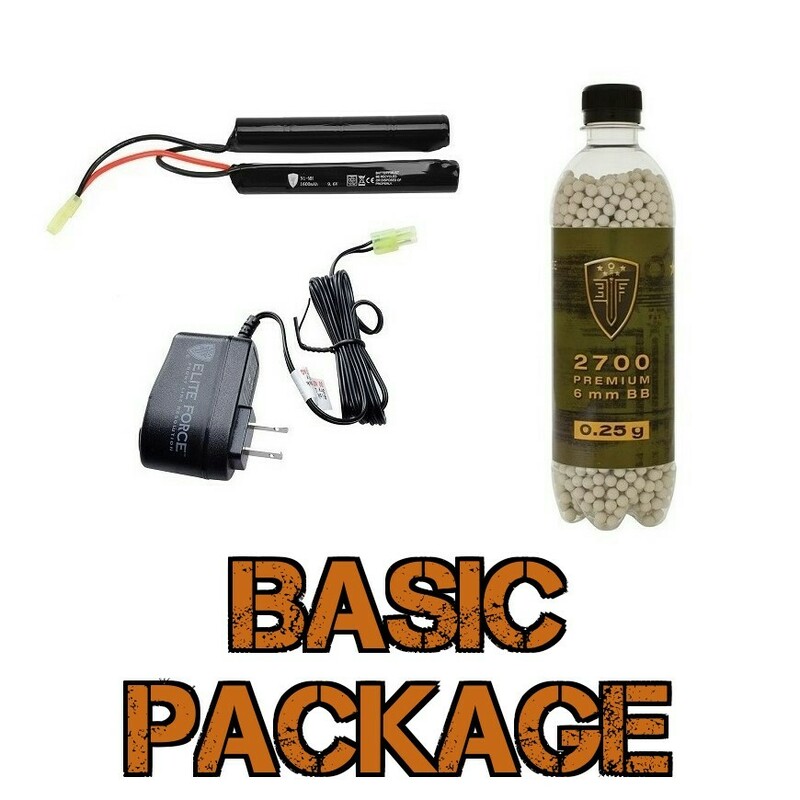 Running a high quality brand of BBs like the Elite Force brand that we carry will ensure the proper feeding and performance of your airsoft gun. Low quality BBs will often jam the gun causing internal gearbox damage. Your gun is not covered by any sort of warranty if you used an extremely low quality of B. 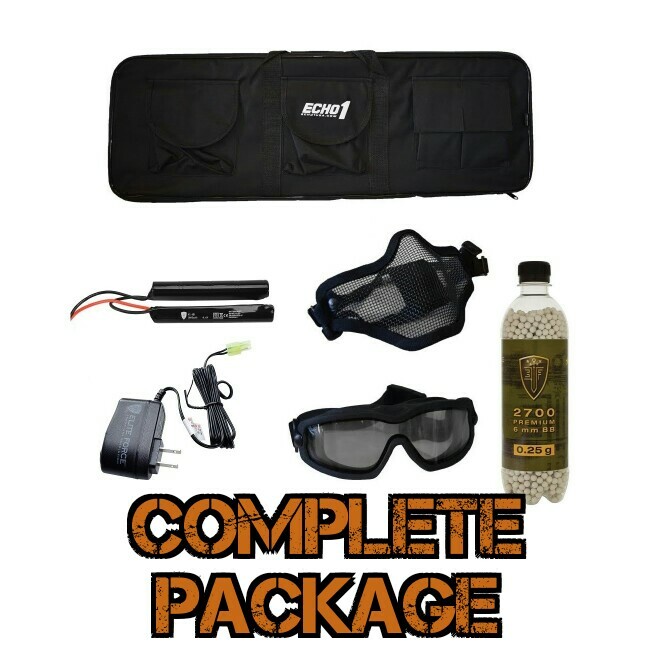 The complete starter kit features all that is included in the basic kit but also prepares you for your first time against other people by adding the required safety gear. First you will get some Z87 ANSI rated goggles. These will fit most people and should fully seal around your eyes. The lenses are ballistic impact rated and among the safest to wear while playing airsoft. The other component to your face protection gear will be the lower mesh mask. This is a popular solution for protecting your lower face while maintaining the breath-ability that would normally be hindered by a full paintball mask setup. Lastly, you will get a proper gun bag to store or transport your airsoft gun safely.